Earlier last week I was asked by a visitor why the water was so green. I answered simply by saying it was because of the heat that the algae was growing faster than during the colder months. While my answer sounded correct it wasn’t. The heat isn’t the contributing factor to the growth of the algae, it’s the sun. Algae is like any other plant. It doesn’t need extreme heat to function, it needs direct sunlight. We hear about house plants needing direct sunlight to grow properly, but have you ever considered what that means? Some Harvard graduates were asked the simple question of why is the equator is hotter than the poles. Surprisingly a large portion of the student got the answer wrong. While these two questions seem different, they are actually the same question. The earth is not hotter at the equator because it is closer to the sun, but because the sun rays are more direct at that point than at the poles. The graphic to the left shows that the rays of sunlight are more direct at the equator while the ones at the poles are more spread out. Using this information we can then relate it to the tilt of the earth. We all know that the summer is hotter than the winter, but the reason for this is the tilt of the earth. During the winter months the northern hemisphere is tilted away from the sun, while the summer months it is tilted towards. The graphic to the right shows the difference in direct sunlight between the summer months (top graphic) and winter months (bottom graphic). With this information you will know more about the seasons than some Harvard graduates, and know the real truth behind algae even if a park ranger says it wrong. 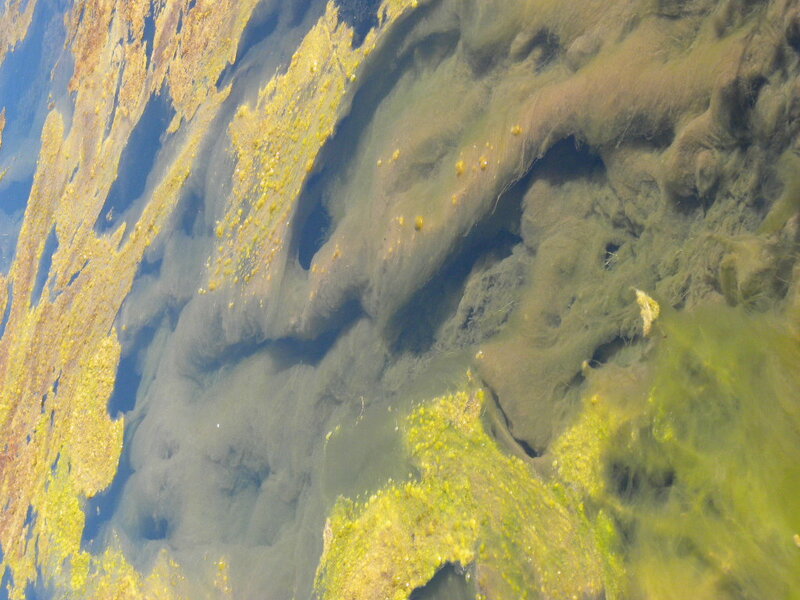 In the Sumpter Valley Dredge State Park we are lucky enough to have algae in our pond taking full advantage of the sunlight. The algae found in the park is called Spirogyra, it is a type of green algae. This algae is characterized by the long tube like strands it forms in. Each strand holds chloroplast, or the cell responsible for converting sunlight into food. 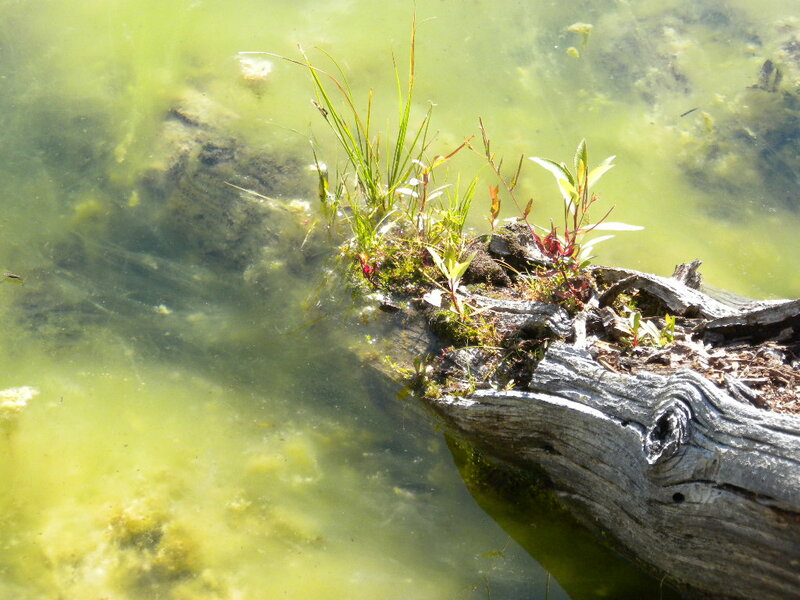 This algae is responsible for releasing oxygen into the water, and providing shelter for the fish and other organisms in the ponds. So while the Rangers may fight to keep the drainage system open, the fish love the added green to the pond. Not only is algae an important part of the ecosystem today, but it is believed that Spirogyra had a large role in building our planet. Research has shown that the first moss responsible for populating the land may have come from the very algae we enjoy today. Because of its structure it is believed that it may have moved to dry land and taken root, forming the first dry land plant. So the next time you take a stroll next to the ponds in the park enjoy the algae. The beautiful colors, the amazing fish habitat, and the 500 million year old organism that may have helped create the beautiful plants we enjoy today.